Enjoy a leisurely half-day ice fishing trip on a frozen river or lake. 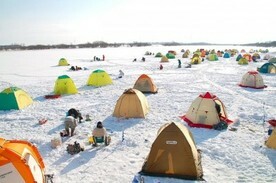 Your guide will help you set-up the tent, drill a hole, and catch some delectable wakasagi (smelt). The fish will then be made into tempura or roasted, and is perfectly complimented by warm sake (Japanese rice wine). 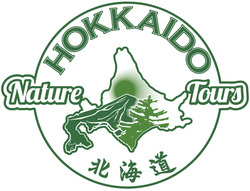 This activity is a great addition to a multi-day Custom-Made Tour around Hokkaido. Situated a mere 30 minutes from downtown Sapporo, the Barato River is a popular spot for smelt fishing, and a nearby restaurant will fry up your catch into tempura. The ice at Lake Akan is thick enough to be used as a parking lot, and the long-running winter festival has very affordable ice fishing as well. 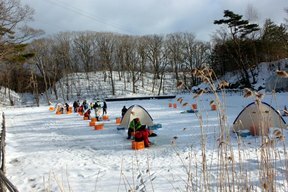 What's not to love about ice fishing for as little as 500 yen per person! As the first ice fishing location to open every winter, and due to its proximity to Furano, Lake Kanayama is one of our favorite destinations. Here, there are no restaurants nearby but your fishing guide will prepare any smelt that you catch into tasty tempura. Located in the Ishikari Plain one hour from Sapporo, Shinshinotsu village is a typical Hokkaido inaka village where you can enjoy the atmosphere of rural Japan. There is also an onsen (hot springs) located in the same compound, and entry is included in the activity price. Lake Onuma is known for its countless islets and quaint scenery, and is one of Hokkaido's most beautiful lakes. 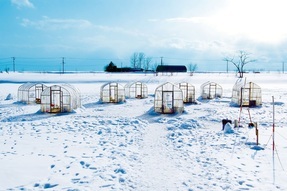 Ice fishing is possible there during January and February and it's located an hour north of Hakodate.